In case you haven’t read the background to this story, I recommend you first read “The Surrogate Interview” before proceeding. Lalu Prasad Yadav is a convict out on bail. His only reason for being there is media loves criminals and non-performers. Akhilesh Yadav, another non-performer, is better off being paired with someone like Rahul Gandhi, who he can match his intelligence with. Only Mamata Banerjee has some standing as a political leader but hardly a contender for anything other than deputing her party members as puppet ministers in case she is an alliance that comes to power. There is something that people have noticed about NL. Ever since the AAP party formed a govt in Delhi, its approach and attitude to many issues and the MSM has been perceived to have undergone a change. One can measure this by the many comments on their site and also many tweets on the topic. Madhu Trehan claimed in an interview with TheNewsMinute that when the event became public there was outrage and abuse. I don’t quite agree with that. Yes, there was outrage but “abuse” is a term which is quickly resorted to by MSM folks as a first resort in a lost plot. Madhu should be careful in resorting to such terms. In a poll for “India’s Best Journalists” in 2012 Madhu was voted as one who had re-invented herself in the age of social media. That reputation is more important than being associated with a bunch of AAPTards and their agenda. The most distasteful evidence of this was an article trashing Tarun Tejpal’s victim as a “bubblegum feminist”. One of the surprising things about this event is that it does not have a single representative of a major national party like Congress. The Congress also happens to be the ruling party and the main target of Narendra Modi. This could also be one of the reasons why Modi may have considered it unworthy to be in the company of a motley crew of non-performers, convict and a pathological liar. Maybe, Kejriwal is the default representative of Congress. Who knows! MT has stated she will explain the reasons for Modi’s withdrawal after March 10 when the event is concluded and done with. Any media outlet has the freedom to choose the politicians it wishes to host. The choice of Lalu Prasad is an insult to people’s intelligence. But NL is not the only one, others like TimesNow and CNN-IBN too love to host this criminal for his comic value. But they should remember that politicians too have the freedom to choose and withdraw from events that do not reflect political realities accurately in their title and theme. It is for this reason that I believe Modi has done the right thing in withdrawing from this event. He may, of course, choose to reveal or not reveal his reasons; that’s his privilege. But like I stated in my earlier post on this topic, without Modi this is a still-born event. There is no such thing as Exact reasons as nobody has disclosed the reasons. Niti has only rehashed what was already written by MC in the earlier post of surrogate interview. Couple of days ago there was a tweet from one of the news laundry partner associated with AAP suggesting to some one that "tu nahin samejhega" about what is behind this event. Offcourse we all know now what he meant. On NaMo cancelling the event,Apt reply to the Aaptard would be"AAP nahi Samjhenge". Uppal ji : Sorry to digress. What is offcourse - opposite of oncourse? Did you mean 'of course' ? Bark would have been on cloud nine anticipating the great leader Narendra Modiji on her TV, but Modiji did the right thing by cancelling the interview. I dont care what MT reveals about the real reason behind this. The suspense created by MT on what she will reveal after Mar 10th about the Modijis interview cancellation has created more hype than the interview itself with other 4 non-entities. Its her way to claim fame. I think Madhu Trehan is out-voted in NL and doesn't have much say. I used to see NL regularly for her Clothesline and Ranganathan's articles. These were good satires. Such a pity that mediacrooks are pulling down good journos along with them. Who next? The Jaggi i bet. No matter whos do what but surely NaMo proved right by opting himself out of this nasty comparison. MT should be most happiest person as she got chance to save her image by action of other ..off course NaMo. Yesterday CNN-IBN carried out a discussion on AAP's presence in 2014 elections and it's likely impact. Rajdeep was thrashed by Swapan Dasgupta right and left and also by Dr. Sujeet Bhalla. However Rajdeep kept on peddling the propaganda of AAP for close to an hour. Since 1947 till today in 2014 has any MSM media has ever given so much positive publicity to RSS, BJP or Hindus? What we have seen, heard or read is only abuse. MSM hounded Modi for 12yrs+ and still going on, now they all want to have their 1st interview with Modi for TRPs.NL has many AAPtards.AK pathological liar to the core.Excellent article! Whatever is the reason .. But still it is a very good decision by modiji..infact he need not be giving interviews to so called soul less / honour less corrupt journos..as he is addressing millions every week. Glad that there is something called mediacrooks ..
Why r u dreading for thrashing. Its balanced thought of you. But Modi will be used as a prize catch by those taking his interview (& also those who r behind interview). So after realizing the ulterior motive if he refuses, no harm I feel. I think the reason why Madhu Trehan is so livid is because she knows you have spoken the truth. I do believe Madhu has not yet completely sold her soul and when you prick her conscience, it hurts! So she taunts us are being your chelas with no minds of our own...I hope in future she returns to her honest roots. Good that NAMO didn't go.it would look very odd with likes of Lalu and Kejri.While NL proved quite a refreshing change to media moronery.It has fallen in to AAP trap with those AAPtards manning its set up.Sad. 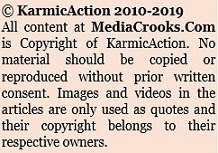 Incidentally both "MEDIA CROOKS " & NL were referred to me by Ms Sandhya Jain of Vijayavaani.Now NL is gone. As regards AK, since last tow days he has started singing different tune.He says that communalism is more dangerous than corruption.This means he too is being funded by secular mafia to some how stop Modi. Actually the rot created by Kejriwal has moved beyond recognition & nowadays most of original AAPtards have either left or are sidelined for any minor dissent. Our great Kejriwal is now on a blind mission of creating martyrdom against NAMO from Varanasi. 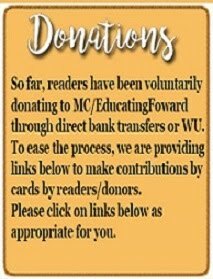 Guess his real money source has given him a final ultimatum. If you closely observe, the picture and caption of the event, two facts come out. 1. First it was titled something like "PM contenders", which then changed to "Candidates 2014". First one being a farce, the second title is no good either. Kejriwal is still an MLA of Delhi Assembly and the stated position of AAP is that no MLA would fight LokSabha election. That being the case how AK figures in the list. Lalu cannot fight an election and Akhilesh most likely would not fight LS, at least that was the understanding when he became CM of UP. Mamta anyway would not fight LS, she having the coveted post of CM of Bengal. So the caption "Candidates 2014" is a farce as well. 2. The placement of pictures is also very suggestive. Modi, AK and Mamta are on the same level, which means AK is a leader in the league of Modi as well as Mamta,who has been endorsed by AK's guru Hazare. So in a single stone hit the two birds. what ‘ the maalkin of this country could not do, what her only prince sorry, shehzada of this country could not do, what all their servants at congress party could not do, what their slaves at hundreds of ngo’s could not do and what the entire electronic media could not do for so many years – one ‘dalal, one fraud, one contract worker is ready to do for all of them – yes, you guessed it right, who else but kejriwal. get ready to witness the onslaught of kejriwal one more time and then more & more times – more severely, more harshly & more violently and this time his target – the biggest, the boldest and the brightest person of this country today – yes, you again guessed it right – narendra damodardas modi. so ‘destroy-modi’ starts again with full force and this time with ‘dalal-kejriwal’ and this ‘project-kejriwal’ took off from yesterday ie. from 2nd of march,2014 onwards when ‘terrorists-sorry-separatists & naxalites supporters like ndtv, cnn-ibn and headlines today all gave live coverage of kejriwal’s rally at kanpur and his anti-modi bark and now onwards, congress funded – congress run – the entire main stream electronic media will project ‘this dalal of congress – kejriwal’ as some sort of warrior, saviour and messiah for the next two months, will try to equate kejriwal with ‘narendra damodardas modi’ at every pretext and instance and somehow declare him as the only worthy contender of modi and rally everybody else ie. all the opponents of modi – around him. under these crooked and sinister plans, one of the plan could be to gatecrash deliberately & intentionally one of the press conferences or rally of narendra modi by this ‘dalal-kejriwal’ calling himself ‘an aam-aadmi and claiming his right to confront and question modi directly and create a ruckus all around and grabbing all the headlines and news for days to come and turning the entire poll plank of bjp on its head ie. from development, from anti-congress which has gained quite a momentum off-late to anti-modi & anti-bjp and thereby, creating confusion and deception all around among the voters and people of india. haven’t we been witness to what happened in delhi state elections results with the cocktail of ‘kejriwal, congress and the entire electronic media. In light of these serious, alarming & dangerous scenarios, isn’t it the right time for bjp to devise an strategy urgently to counter this ‘dalal” and expose, unmask & bare ‘him and his gang’ once & for all before its gets too late. remember, he is out there not only to ‘destroy-modi’ but to ‘destroy-our motherland-our country india. after all, this time it’s not only modi – which is at stake but the entire country at stake. and don’t be surprised at all, if you see aamir khan hosting this ‘d’ in one of the episodes of ‘SMJ-II’. it’s all part of the plan. India's future hangs in the balance. The devil's army of Congress, its lackeys like AAP, the crooked media, NGOs, JNU commies and the rotten 'look after each other' establishment are in a do or die battle. Their dirty game will be over for good if Modi wins handsomely. Modi is not a Delhi drawing room leader like Vajpayee and Advani who had become part of the furniture and who did not lift a finger about the 1984 slaughters, Quattrochi, Bofors, black money, Dawood, etc. Surrogate is aborted by Modi...Waiting what MT has to say after 10 march...surely she is going to lead anti-modi modi MSM campaign now.. 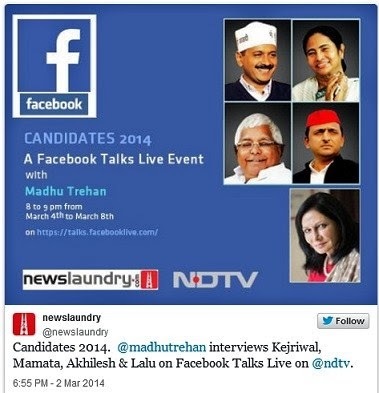 I believe Madhu Trehan is the sister of Aroon Purie of India Today. India Today is now a part of HT and turned anti BJP. 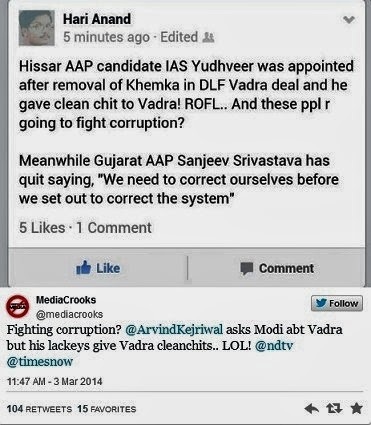 News Laundry is an AAP site, its owners are AAP members and AAP is just another outlet of Sonia's NAC. The less said about Kejriwal the better. The man is beneath contempt. Btw, where is the other Congress stooge Agnivesh nowadays? I suspect they will bring him out and the other stooge Katju in their do-or-die battle. I find it disappointing that they missed Jayalalitha and Owaisi in this elite club..!! You are too soft on Arvind Kejriwal while too harsh on Mamta Banerjee. Mamta is far better than The Pathological Liar. She is no good and certainly not PM candidate or even PM material but still I think she has an identity which Liar lacks. These men in pic have nothing to loss....!!! Specially #DramaMaster AK ... man who is going to be ZERO in next LS Polls ...Sure ..!!! Good decision by NaMo ..!!! This #PresentBodyAbsentMind .... #Yeda(As per Mr. #Malumaat 's logic) AK is hooting to poll aginst #NaMo ..!!!! what would you like to have : maalkin pizza, shehzada burger, khursid-batla house-teary eyed kababs, sibal-silent papads, sinde secular tea or harvard-100ft long dosa. what did you say : none of the above, you want - modi raita - sorry, not available for the next 5 years. prince, it looks you are suffering from constipation : well, we have brand new, tried & tested, 100% guaranteed - kejriwal jamaalghota. i hope, now you will rest in peace. take very good care of your stomach. Ashley you too are a lucid interpreter of the politics !!! But.... I think your CAPS lock/Shift keys don't work or what. Great going though. MediaCrooks should be made Spokesperson of BJP (NaMo) with immediate effect; and next CM candidate of Gujarat, later on. He is the person who can take head-on to anybody in the politics of journalism (Err...journalism of the politics). Those who thinks MediaCrooks is the new hope for Hindus and India, raise your hands !!! Please ask your parents, grandparents, friends and relatives to press the button for lotus. If elderly person in the family cannot walk carry on your shoulder. Reason with them; that wont be difficult. I think MediaCrooks have enough material which can be used while arguing. RahulG can first develop Amethi, AK could have first solved problems of Delhi, Mamata has not completed a single term as WB's CM. These people have not completed class 6 but are wishing to top class 12 exam. Whilst there is not an iota of doubt that narendra Modi is light years ahead as a competent PM candidate. So it was a wise decision to excuse from the ndtv interview. Whilst there is a strong support for Modi visible on the media, But the on ground reality is not encouraging primarily because BJP is lacking organizational drive in some pockets . Especially in Maharashtra and Mumbai. Bjp is lagging behind in personal contact with electorate.they need to Visit the slums , the poor people in every constituency. They would be surprised by the views of a lot of people there. The poor want to vote for only populists who gives them freebies and legitimize their unauthorized colonies . I am basing this on my recent visit to a slum colony to gauge the electorate . People are happy with those who give them rice and wheat and RS 3 and 2 respectively. So bjp do not get carried away by new found allies , personalities , survey results .. There is no substitute for grass roots level connectivity with electorate . It is foolish to just ride one wave ( Modi ). Bjp workers and leaders across the length and breadth of the country should strive to connect with pulse of vofer rather appear on tv debates and cut a sorry figure even there . There are many seats in which the congress candidate seems indefeatable ( ex. Priya dutt ). Compare this with novices of AAP upsetting very strong candidates of Delhi in assembly. There is a lot of ground to be covered and yet bjp and its followers are visible only on tv and media ( including internet , social media ). And absolutely mediocre / non existent on the ground in some pockets . Especially Mumbai and Maharashtra. Hope bjp gets its act right in good time. Sensible and timely advice. Hope BJP people are reading this. Mud slinger Kejriwal has also been able to brainwash a lot of educated people by his rhetoric and with the active support of media crooks. The battle is very tough, BJP must realise that. I belong to Mumbai and the politics of Mumbai is such that MNS & SS has always been the local mass vote pullers while BJP was always looked as a party of middle class. In this sense the Shiv Sena & RPI ( Dalit party ) has a good hold over the slums in Mumbai, although Congress, NCP loose no chance in throwing freebies on the slum dwellers particularly before elections & maintain pockets of influence. Anyways BJP was never a force in Mumbai & always won 1 seat (Ram Naik) out of total 6 seats. madhu trehan - the new 'paaltu assistant of 'dalal-kejriwal'.